You look great in your new pants Emileigh! The one thing that has prohibited me, at any time, from realizing various wardrobe dreams is lack of monetary funds. But! That made me think and reevaluate more exactly what it was that I wanted. What beautiful pants! I agree that finding trousers which fit is very hard. And finding ones with attractive style even harder. In female fashion, I focus more on dresses and look for ones that disguise my cylindrical shape. 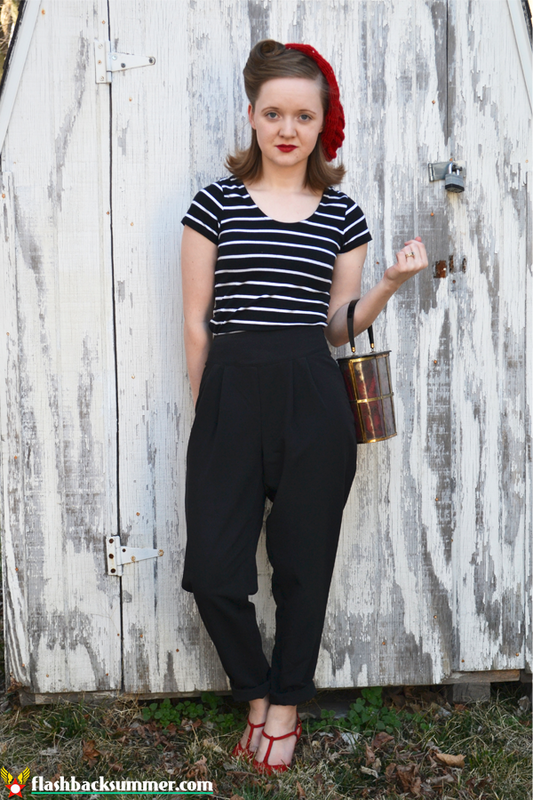 Fit-and-flare works for me. I have few pairs of pants outside of jeans, or a jean variant, like colored denim clam diggers, so I completely identify with the pant problem. 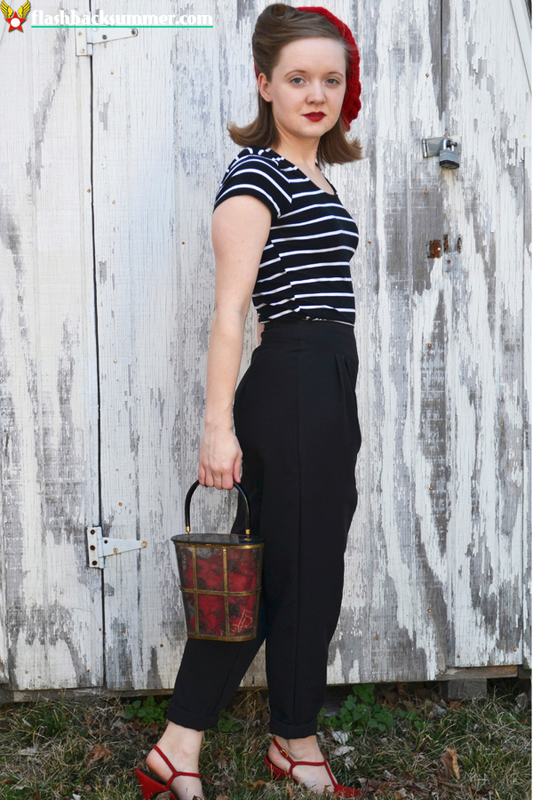 I long for a slimmer cut in pants, but once I put them on my body, I loathe them, but also feel like new pants are the key to opening up other areas of my wardrobe, so I totally identify here! I also identify with the sewing/work conundrum, since after moving, I didn't want to touch my sewing machine, and now I am working! With my latest (and still somewhat active) wardrobe crisis, much of my pain came from trying to find new sources of clothing that met the standards I was used to or supported the business ethic I wanted to support. The last thing I wanted was to buy new clothing that I loved, but only to have it fall apart within a few wearings. Even after hauling out every item I owned and selling many pieces what feels like eons ago, I am still battling my wardrobe in attempts to revamp it. I think one key was to keep reminding myself to wear what I like, and don't worry about period accuracy, unless I really want to, depending on the event. Dress up and have fun. Damn, sorry to hear about your Freddies! I was crossing my fingers for you! Yeah, I've been having some issues with my wardrobe revamp as well. I'm on pretty strict budget so I've only made a small dent in replenishing but it's giving me time to think about what I really want in my wardrobe and not to just fill it up with a bunch of stuff again. The new pieces that I have purchased were all winners so I'm on the right track! Revamping an entire wardrobe is always a bit of a struggle, though I am going in the other direction-more and more vintage looking items! I would like to say on the sizing front that I know Banana Republic offers many styles of work appropriate pants, none are quite high rise, but none are low rise in any way. They offer both short lengths and petites online and you can make returns in store (can you tell I am a sales associate there part time?). Good luck on the pants sewing adventure! I actually stopped in to a Banana Republic store and tried several pairs on. I like them a lot, but none of them were quite high rise enough. I have mostly natural waist length shirts, so they'll be crop tops if I don't get high enough pants! Oh lovely outfit!!! You're beautiful, "très chic" in french! it's perfect! I think it's very difficult to find good pants...I haven't find mine! the reason why I prefer skirts and dresses to trousers: trousers don't fit my figure. Buying pants is just depressing! recently I just found two great pair of pants at (tatatataaa) H&M. 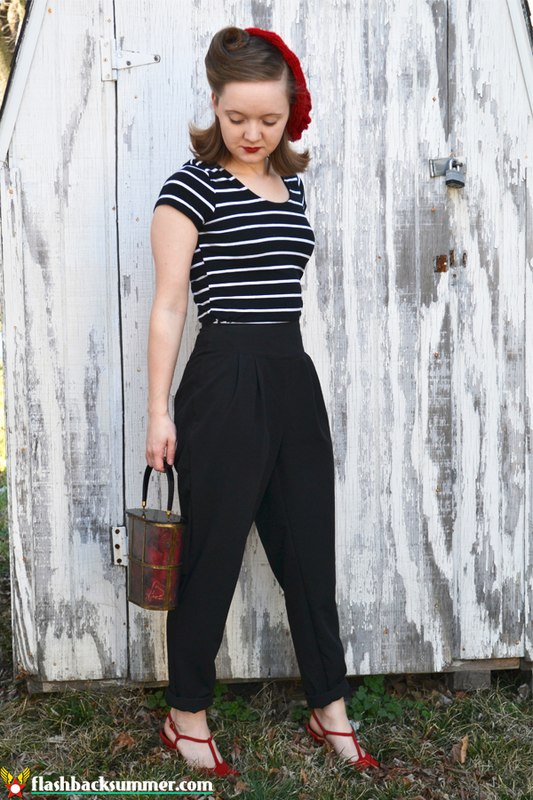 Hightwaisted, vintage look, comfortable as hell and affordable! I alomost lived in them the past weeks. I don't know, if they might fit into your idea of yor new wardrobe - but check them out on my little blog. They are still in the shops. Don't stress yourself with finding you new style ... a well filled and suitable wardrobe builds up slowly. the more you stress, the more you will end up with pieces that won't satisfy your wants and needs. Your last sentence… I basically need to tell myself everyday. That's so true! I'll try not to stress! After the baby I suddenly found myself without any pants that fit, and it was very strange for me to only have dresses and skirts at my disposal. I usually live in jeans! It was very good for me to be forced out of my comfort zone, but I am super glad to have a pair of jeans that fit again. I feel like I never realised how difficult pants are, until I really saw other people's attempts to make their own, and until I tried to get some that really fit well (as opposed to relying on stretch, or just wearing them baggy so it didn't matter). But when you look at people's bodies and how ridiculously varied we are, it isn't exactly surprising. Just frustrating! Good luck with the rest of your slow pants journey. You are off to a good start with these ones! I am loving your blog! Those pants are fantastic, and the red accents are a needed addition. I have had some 'spring' cleaning going on for a while and I have finally got back into the swing of sewing. I cannot wait to create a new wardrobe. I am definitely inspired by many outfits you post here. Keep it up, I hope to hear more from you. Thank you so much, Victoria Anne! I'm glad you're enjoying them! Way to stick it out, dear gal! I'm sorry that finding pants that work for you has been such a challenge. I'm convinced that they're one of the trickiest pieces for a lot of ladies to find in a style and size that genuinely fits them well. They've always, bar none, been the hardest garment for me and my short, curvy shape. 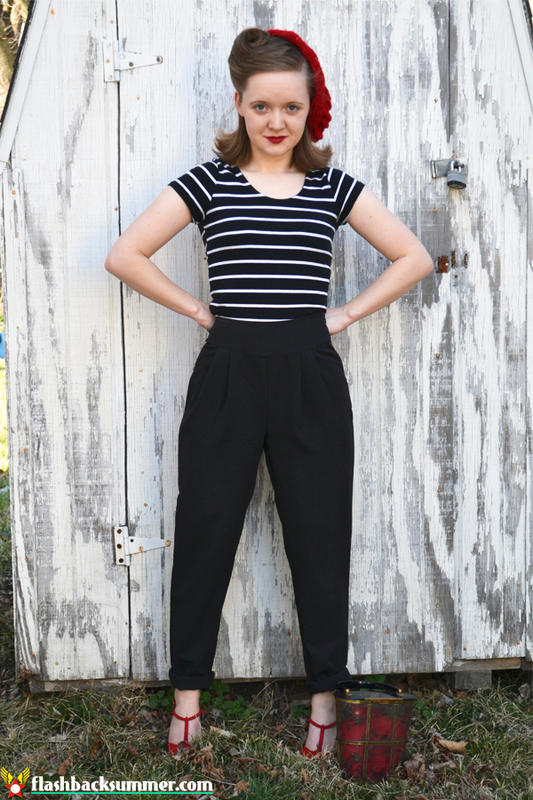 If not for a small number of wide legged options from a couple of repro/vintage inspired brands, I would be as a good as pants-less, and promise you that you have my total understanding on this front. I feel your pain; I remember when I first started investing in vintage, I wanted a full-blown, all day, all the time wardrobe NOW. And I might be closer to that now that I'm four-ish years into collecting, but I'm still not there yet and I have to remind myself that that is ok. I didn't even think of Land's End! I'll have to check them out! Thanks, Megalina!